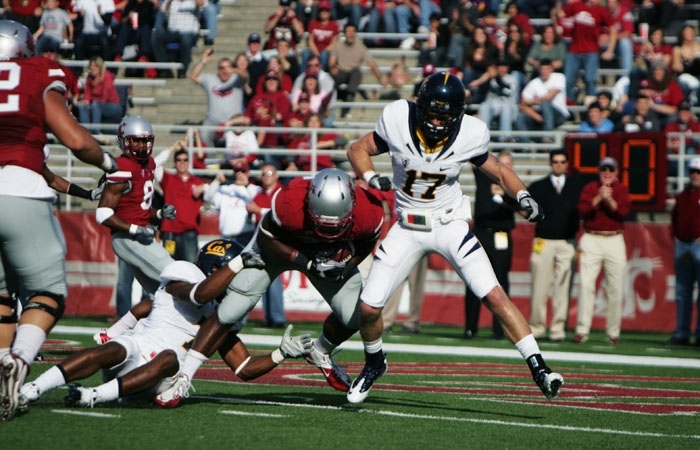 Chris Conte had a breakout senior season at Cal as a safety. Before the Cal football team's 2010 campaign, the idea that Shane Vereen, the squad's biggest offensive weapon, and Mike Mohamed, the anchor of its stingy defense, would be drafted seemed certain. Few envisioned the selection of Chris Conte in between - but that's exactly what unfolded in the final two days of the 2011 NFL Draft. The Chicago Bears took him in the third round with the 93rd overall pick on Friday, one round after New England picked Vereen and three rounds before Denver chose Mohamed. Conte was elated when he received the phone call. "That was probably the most exciting moment I've ever had," Conte said in his media teleconference. "It was the culmination of a whole bunch of different feelings." His third round selection was also quite the surprise. Conte had played sporadically as a cornerback during his first three seasons in Berkeley - and even after a breakout senior campaign, which included 12 starts and All-Pac-10 first team honors as a safety, Conte did not participate in any marquee All-Star games. Conte has room for improvement since he only started - and played safety - for one season. Vereen, on the other hand, had been a workhorse tailback for two seasons. Vereen, who was chosen by the New England Patriots as the 56th overall pick, nearly gained 1,000 yards while backing up Jahvid Best in 2009. As the full-time starter in 2010, he rushed for 1,167 yards and scored 13 touchdowns to earn second team All-Pac-10 honors. His 29 career rushing scores, 35 total touchdowns and 4,069 all-purpose yards all rank in the top five of Cal's record books. "This is very exciting for me and my family," Vereen said. "It's (a) testament to Cal running backs, a testament to the University of California. I'm just looking forward to this opportunity that I've always dreamed of." The Valencia, Calif., native follows in the footsteps of recent Cal running backs now in the NFL, including Marshawn Lynch, Justin Forsett and Best. Scout don't see too high of a ceiling for Vereen, citing his size and speed, but his versatility in catching out of the back field, blocking and vision should provide him a healthy NFL career. Mohamed, the final Cal player to hear his name called, was to the Bears' defense what Vereen was to the offense: a consistent, steadying force. The linebacker may not have the athleticism and physical tools to start for the Denver Broncos, who drafted him with the 189th overall pick, but he is considered to be a hard worker with good playing instincts and high character. Mohamed was selected after turning in a 95-tackle senior season in 2010, which saw him named to the All-Pac-10 second team. His 2009 campaign was even more impressive. The Brawley, Calif., native led the conference in tackles with 112 and recorded a team-high three interceptions that fall. None were more critical than the one he caught from Stanford's Andrew Luck in the Big Game to clinch the victory for the Bears. The rivalry made for an interesting dialogue when Mohamed spoke with former Cardinal and Bronco standout John Elway, now Denver's executive vice president of football operations, after being picked. "(He said) 'Imagine a Stanford guy picking a Cal guy,'" Mohamed said. "I thought that was pretty funny."